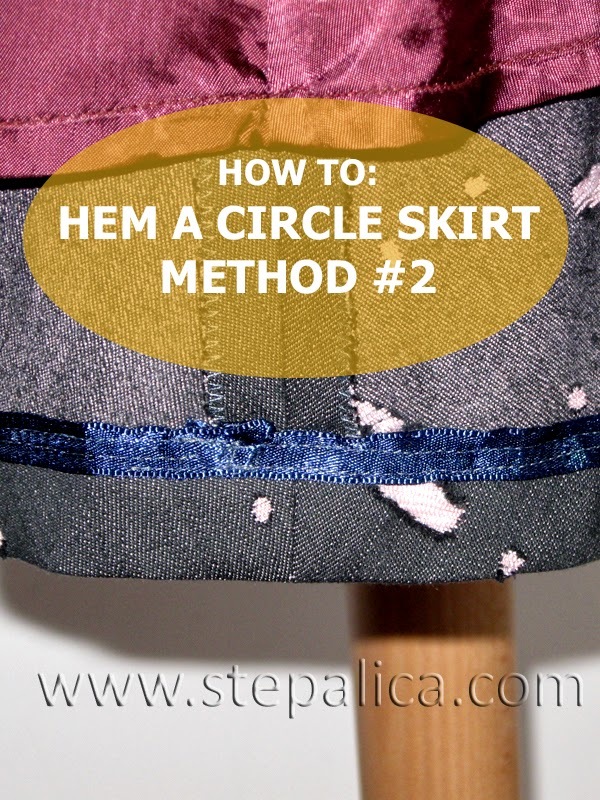 The second method for hemming a skirt can be applied to both circle and pencil skirts. 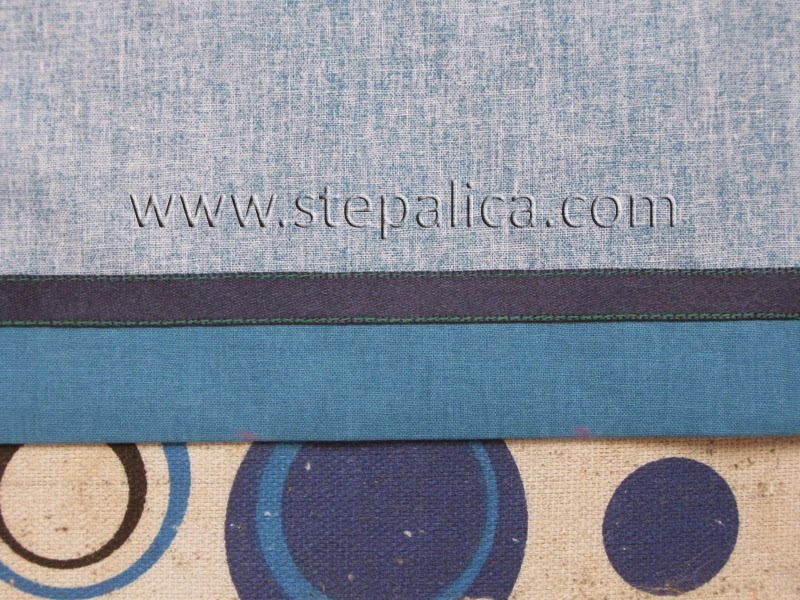 This technique is appropriate for medium to thick fabrics that can show off some topstitching at the hemline on the right side, like linen, cotton, denim, corduroy, twill and similar. Since I didn't manage to snap some photos of the process while making the skirt, I will show you the technique on fabric remnants. You will need a narrow band for this - it can be a satin band, or a bias band, lace, twill, etc. 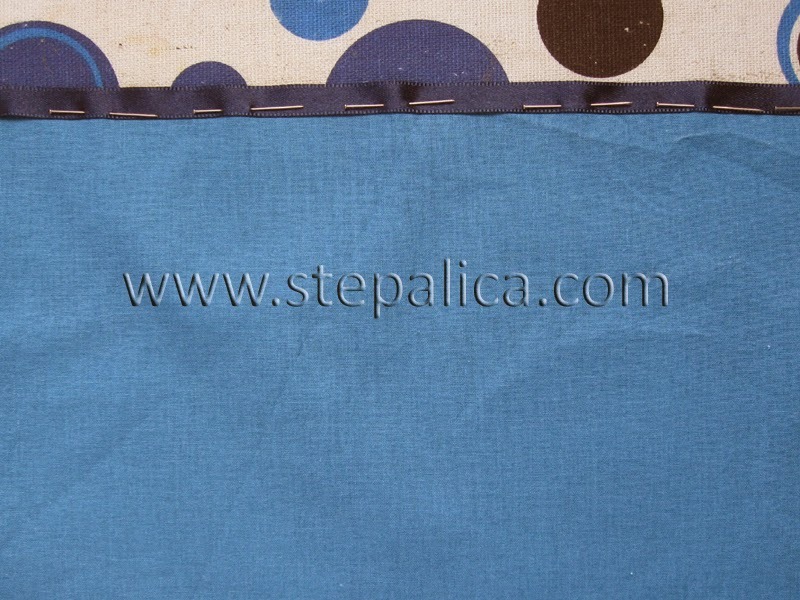 The band will cover the raw edge of the fabric and make the hemline really neat and pretty. If you're hemming a circle skirt, I advise you to use a band with 1 - 1.5 cm width, especially if it's not stretchy at all. If you're using a bias band it can be slightly wider, since it can mold to the curved line quite well. Lay the band with right side down to a working surface. Place the skirt over it, also with right side down. Pin the band to the skirt, making sure the skirt is slightly shifted down compared to the band, as shown on the picture. Flip the fabric so that the right side is faced up. 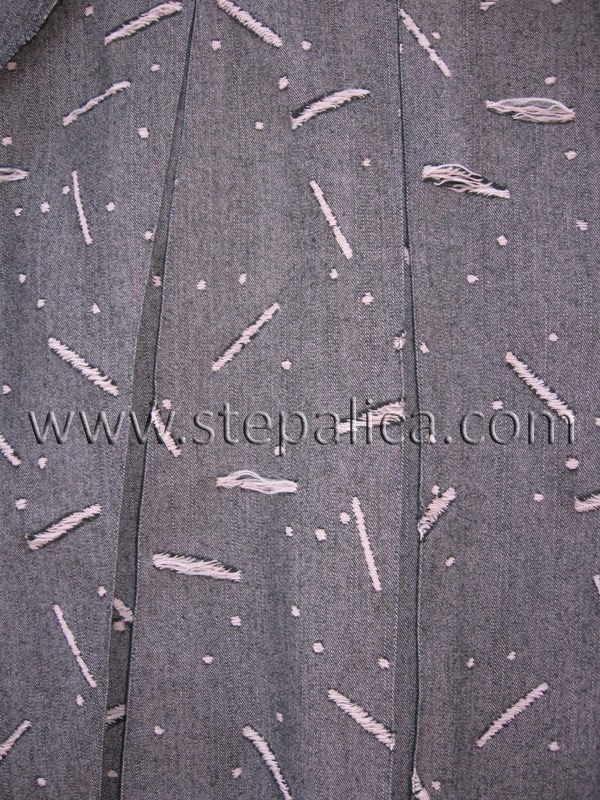 Repin again, by moving pins one by one from the wrong side to the right side of the fabric. Make sure not to shift the band nor the skirt while repinning. 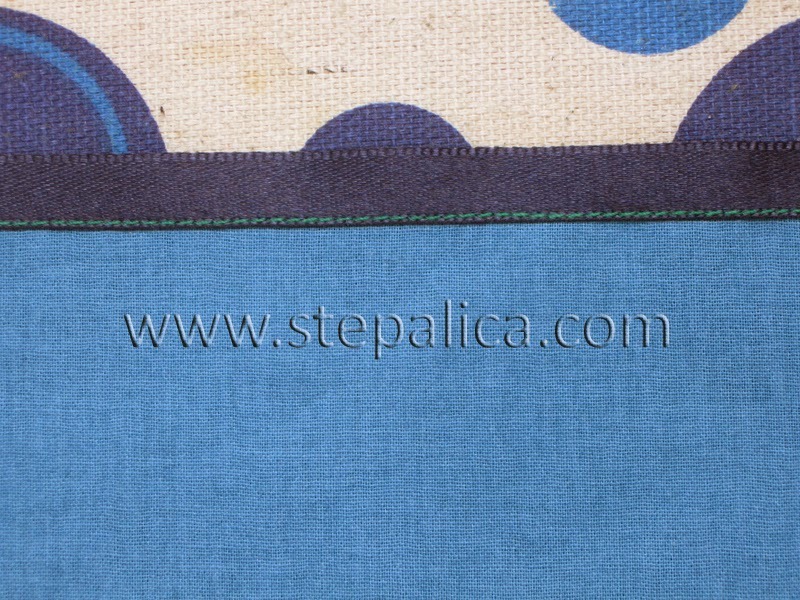 Replacing the pins will enable easier sewing, since you'll stitch with the right side of the fabric up. Sew the band to the skirt. 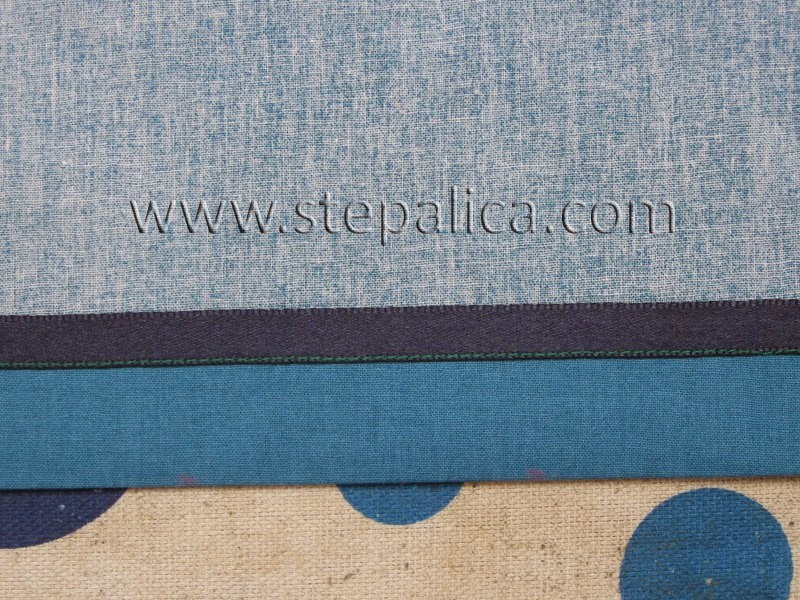 Ideally, you should stitch right next to the edge of the band, but this is not mandatory - what matters is that the stitch goes through both layers of fabric. Fold the fabric up with wrong sides together, with the amount of fold being equal to the width of the hemline you'd like to have. 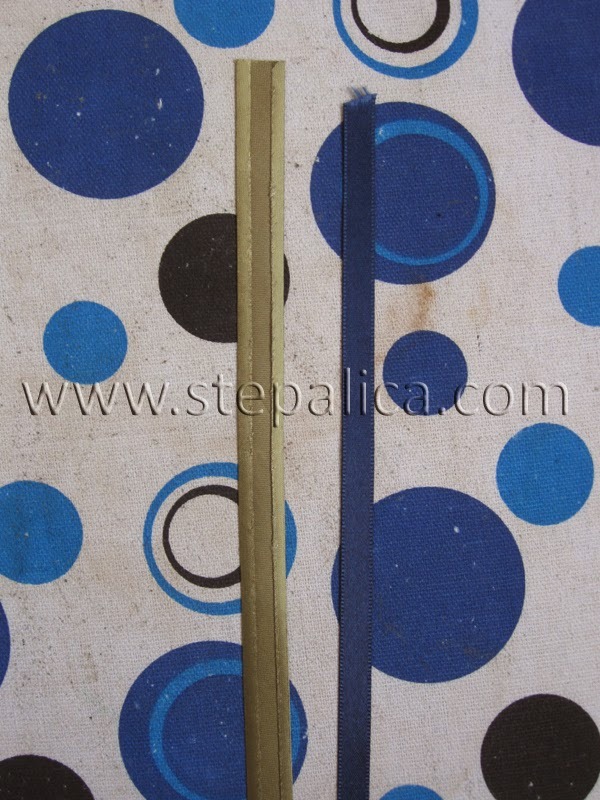 The same stands here as for the previously described method - the hemline should be 2 - 2.5 cm wide for circle skirts. Press the fold line. You can pin the fold in place, by positioning the pins to be perpendicular to the hemline - this will stabilize the fabric and spread the excess fabric evenly along the hemline. 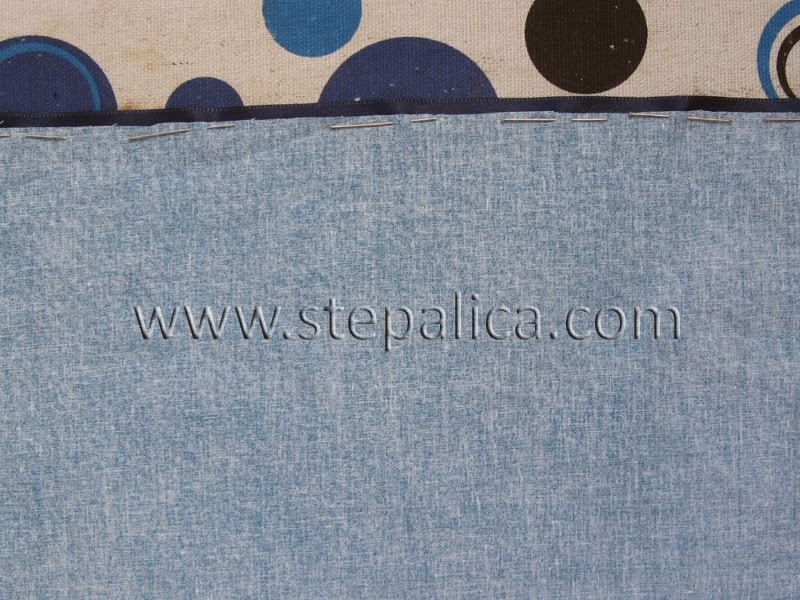 Sew the hemline in place, by stitching next to the top edge of the band. Again - you don't have to sew at the very edge of the band, but sewing this way will make your hemline really neat and pretty. 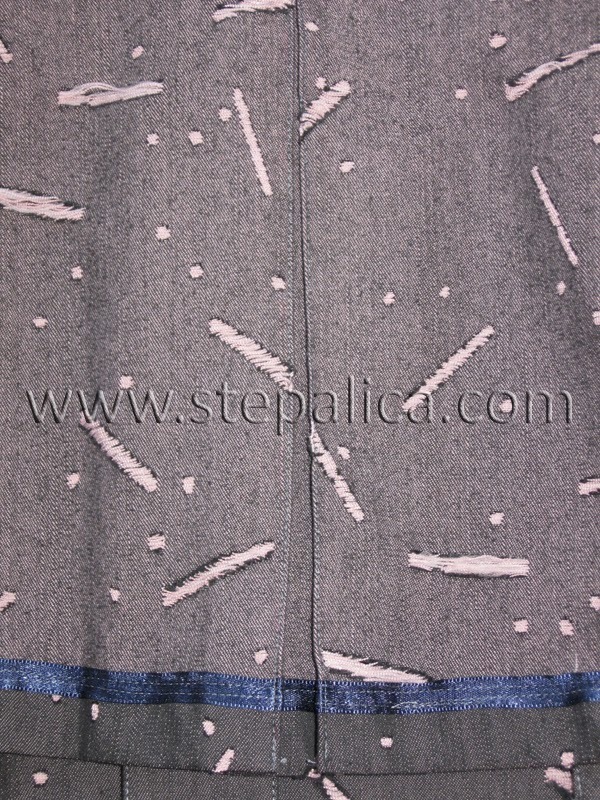 Here's how the hemline looks on the skirt. You can see the stitching lines were not places next to the edges of the satin band, and the hemline isn't as neat as the one on the pics above. 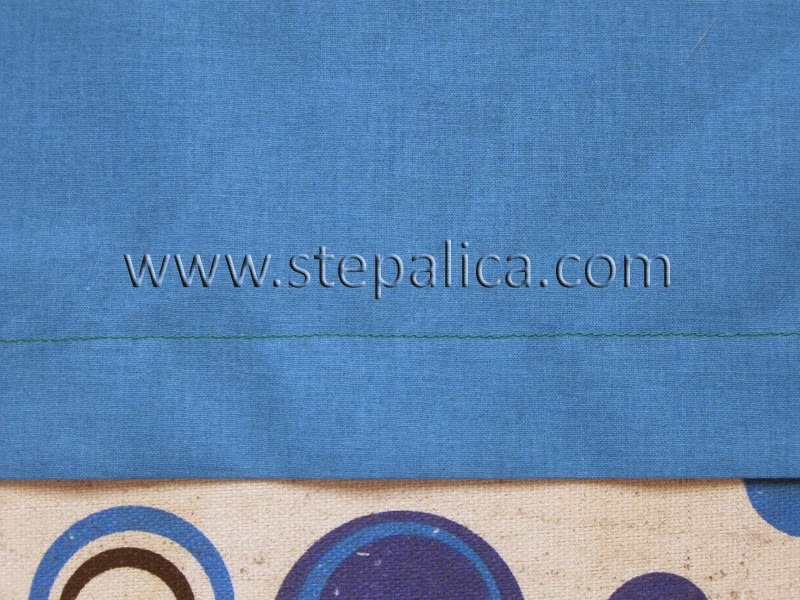 If you want to topstitch the pleat folds to keep their shape, now is the tome to do so. 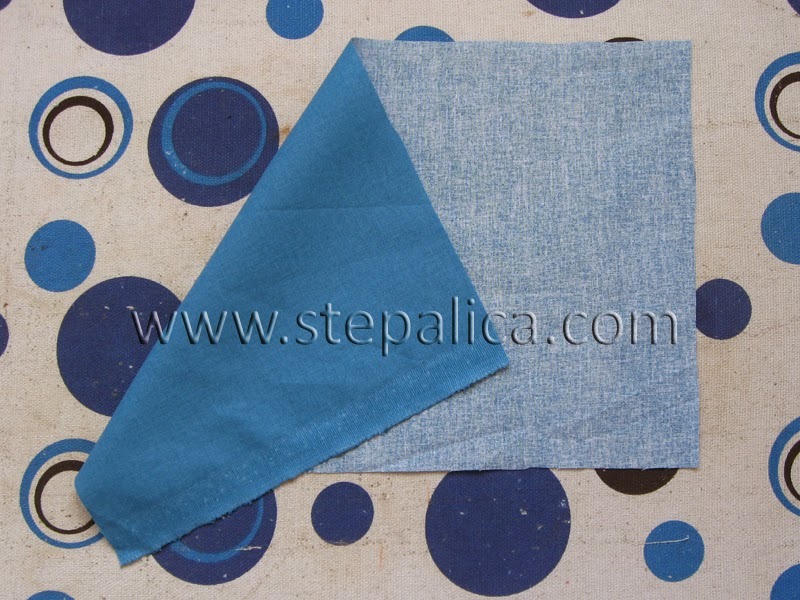 Try to sew at the fold of the fabric. Edgestitch all inner and outer folds of the pleats. You'll have a lot of work to do here, since there are 40 pleat folds on the skirt, but it's worth the effort as this will make the skirt much easier to maintain and press, especially after it's being washed. 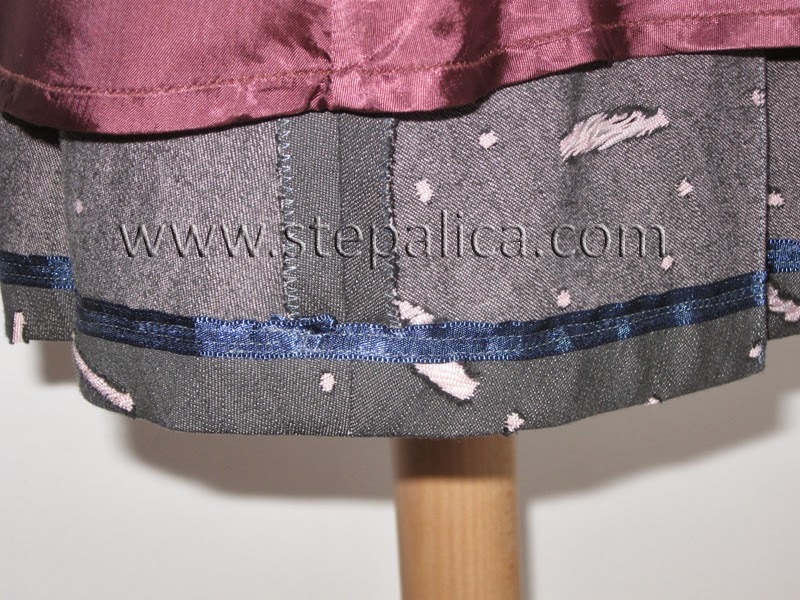 I'll show you on Monday the third method for hemming the skirt. 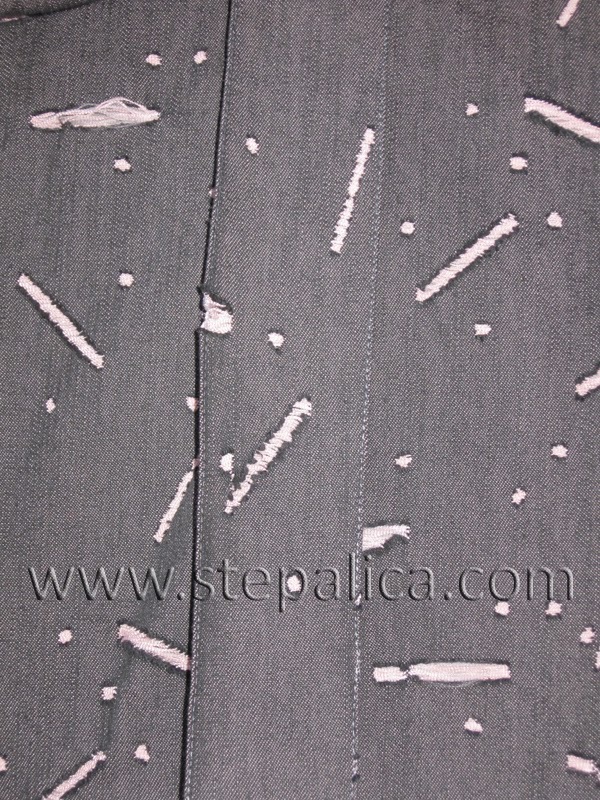 This technique is appropriate for medium to heavy weight fabrics like suiting, tweed, boucle, and all other fabrics that you don't want to show off the topstitching.